Good news to all Talk N Text prepaid subscribers, you can now avail their latest LTE Sim cards for only 30 pesos. For those 4G/LTE ready phones and location you can use this SIM to get faster internet from Smart/TNT cellular network that could reach the speed of up to 40+ Mbps. You can also insert this on your LTE ready pocket Wi-Fi and modem to connect your wireless devices like tablets, smartphone and laptops. You can also register to their LTE promo like Surfmax while using this SIM, just use to default APN configuration on your phone to avoid browsing issues. If you’re asking where to buy this LTE sim card, just inquire and check at your nearest Smart/TNT load retailers. 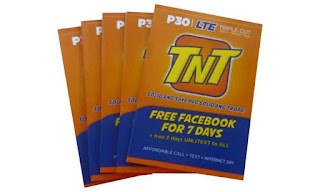 For only P30, you can get free Facebook for one week and 2 day’s unlimited texts to all networks. Another good thing is that you can use this SIM on any type of slot as this comes with a Tri-cut version. You can use it as a Nano, Micro and regular sim card. Have you heard about the TNT Techno User SIM? It offers unlimited Facebook for only 10 pesos. It is also powered by the Smart LTE network and works like a normal Talk N Text SIM card. You can benefit with its LTE feature when your device and location is already covered by Smart/TNT LTE network. If not, you don’t need to worry as it will work as normal SIM. You can use it to register any promo for call, text and internet. How to get/claim/register the promo that 7 days free fb and 2 days unli to all?? how to activate the sim?? Wla namang free 2 days unli txt to allnet. Pano ba to?nid ba I activate? wala na bang register sa TNT LTE na unli call and txt kundi yung AM15 ? ang panget naman po . tska paano po ba ma aactive tong sim ?